This is just a quick introduction video on what SQLd360 is, where to download it (Download section here on the right :D), how to execute it and what’s the output you should expect. Hope you like it and feedbacks are welcome as usual! Using SQLd360 from Mauro Pagano on Vimeo. 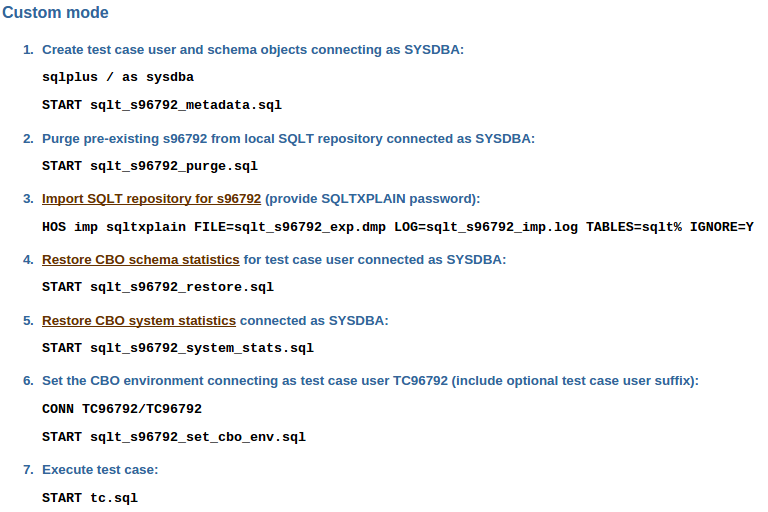 Categories: SQLd360 | Tags: CBO, SQL Tuning, SQLd360, TC | Permalink. Testcases for SQL Tuning, build a hypothesis… and test it! Most of the overall database performance issues (not caused by SQL tuning) are pretty complex to setup because they require a workload and it takes quite some work to reproduce concurrency in a test environment where at best you got a couple folks testing some new code. Nowadays there are ways to reproduce a realistic workload (ie. Real Application Testing) but still it’s not a 2 minutes deal. One of the reasons why I like SQL Tuning so much is the ability to easily (dis)prove my hypotheses and so being able to gain a little more confidence on the root cause and how to fix the problem, the famous “I tested it!”. Regardless where your SQL runs, the optimizer will work the same. I think of the optimizer as a deterministic mathematical model where given the same inputs (SQL, binds, stats, etc etc) I will receive the same output (execution plan), so to get the same output we just need to provide the same input!! In summary to build a testcase we “just” need to collect all those info the optimizer uses when trying to find an optimal plan for our SQL, problem is putting all the pieces together and packing them in some sort of portable way may require a lot of time if performed manually. So how do we install the testcase? Still sounds a lot of work looking at all those files! Good news is SQLT provides a “hat” script (xpress.sql) that takes care of starting all the other scripts in the right order so from our point of view all it takes to install a testcase is unzip the file and start xpress.sql. It takes probably less than a couple minutes to install most of the testcases and once you have it in place it’s just a matter of proving your hypothesis right (or wrong) without having to touch the source system in any way. Categories: SQL Tuning | Tags: SQLT, TC | Permalink.